Life+GreenWoolF is a project co-funded by the European Community under the LIFE financial instrument with the Grant Agreement LIFE 12 ENV/IT000439. 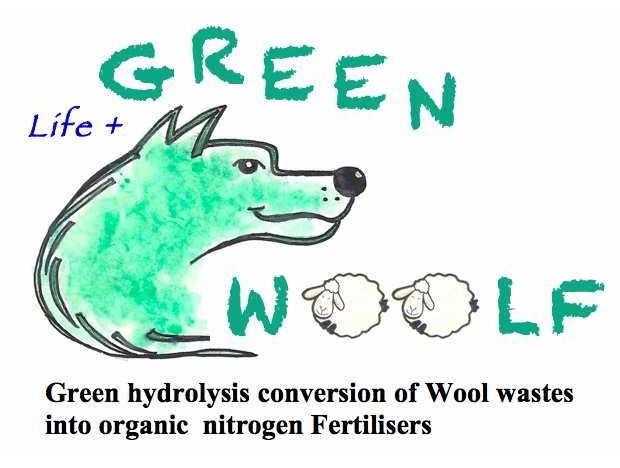 As GreenWoolF would be the imaginary “environmentalist wolf” which only eat sheep’s wool which is disposed of, the project proposal is aimed to demonstrate the effectiveness of a green process to convert wool wastes into high value fertilizer, which could be of great help to farms throwing away wool-based materials. The process is designed to be cheap and chemical free, since neither alkalis or acids nor toxic sulphides or expensive enzymes are used. Coarse wool from EU sheep farming and butchery industry is essentially a worth nothing by-product which is unserviceable for textile application. Nevertheless, annual shearing, which is necessary for the well being of the animals, produces 1,5 – 3 kg head of coarse wool (that is more than 200 thousands tons in EU of which 18-20 thousand tons in Italy), but there is no available information on the amount of waste wool which is disposed of, probably because of illegal practices of storage, transportation and disposal. Therefore, poor quality wool produces large volumes of waste which represent an environmental problem, since burning wool for fuel is inefficient because it is self-extinguishing (LOI > 21%), and co- firing is polluting because of its high sulphur content (3-4% by weight.). Transportation of raw (greasy) wool is subjected to restrictions provided by the Commission Regulation (EU) No 142/2011 for Class 3 Materials. Moreover since EU Commission Regulation allows to sheep farmers to carry out the scouring process themselves, the pollutant effluents from wool scouring could not be easily controlled resulting in additional environmental problem. Effluent treatment will generate large amount of highly contaminated sludge, and attention must be given to its beneficial re-use or safe disposal. Controlled treatment with superheated water converts wool keratin (the wool protein) into simpler compounds, and allows tailoring the release speed of nutrients to plants. Nevertheless, raw wool contains elements such as carbon, nitrogen and other nutrients, which play an essential role in plant nutrition. The organic nitrogen is the main source of nourishment of plants. Organic nitrogen comes from the decomposition of animals and plants in soil. There is large amount of nitrogen in organic matter under decomposition: the first stage of this process is the hydrolysis of proteins into their primary constituents, the amino acids. Soil organic matter or soil ‘humus’ is a major determinant of carbon and nutrient cycling in the biosphere: it is the main nutrient source for plant growth (after microbial decomposition) and contributes to the soil quality (soil structure, resistance to erosion). Moreover, hydrolysed wool absorb and retain moisture very effectively; this property can be a benefit when applied to soils where it can reduce runoff of contaminants such as pesticides, and can aid in water conservation. Superheated water will also hydrolyse wool wax and inactivate pesticide residues. 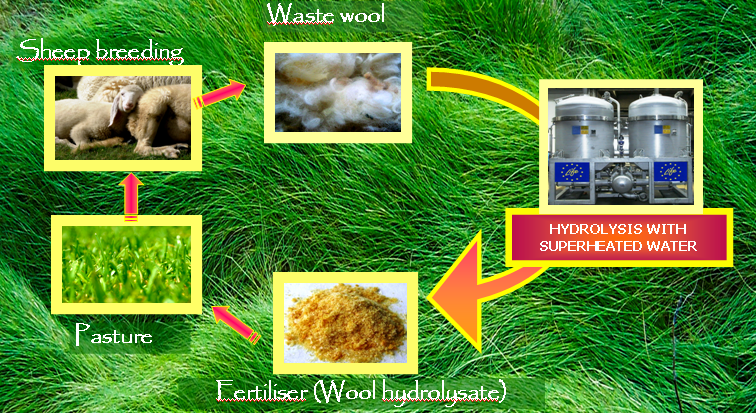 The project aims to demonstrate the viability of converting waste wool into amendment fertilisers using small-scale, local hydrolysis plants, thus reducing transportation costs of both fertilisers and wool wastes, and eliminating scouring and disposal of coarse wools. Unserviceable grease wool will be converted into an effective soil conditioner fertiliser, with a demonstration unit able to manage 1/3 of the Piedmont annual wool clip (1ton/day), specifically designed and built. Tuning of the process will tailor the release speed of nutrients and bio-stimulants and the water storage capacity, which will be specifically tested.